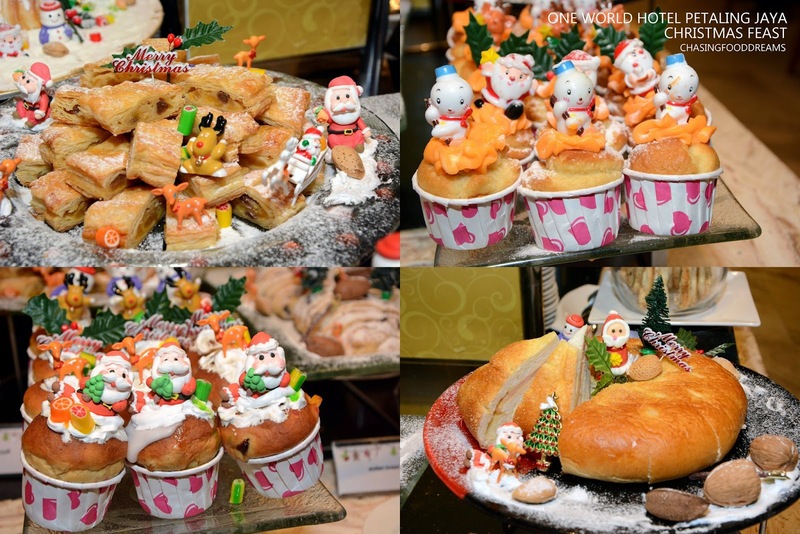 One World Hotel Petaling Jaya presents the Wonders of Christmas this Yuletide season with lots of deliciousness at their award winning Cinnamon Coffee House and Zuan Yuan Chinese Restaurant this year. For a Yuletide like no other, indulge in hotel’s restaurants offerings of a kaleidoscope of festive dishes together with family and friends. Cinnamon Coffee House offers a wide spread of mouth-watering festive dishes together with lots of local delights as well. This year, Cinnamon Coffee House will be offering a Yuletide Eve Glow Buffet Dinner, A Mystical Noel Dinner and A Candyland Hi-Tea. 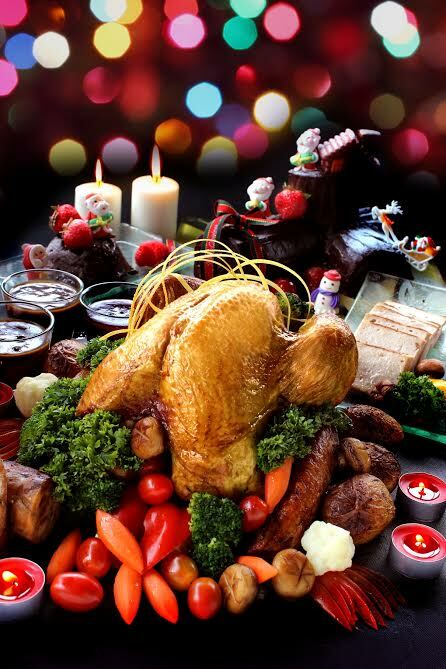 Savor festive flavours concocted by the master chefs for this Wonders of Christmas feasting. Let’s start with classics! The highlights of the feasts are Traditional Roasted Turkey with Chestnut Stuffing, Roasted Potatoes, Brussel Sprouts, Glazed Carrots and Sautéed Mushrooms completed with Giblet Gravy and Cranberry. A majestic Roasted Striploin joins the spread of the carvery to the delights of beef lovers. Other main course to revel in the Santa’s delicious workshop includes the Chicken Cordon Bleu, Cassoulet Lamb Bourguignon, Grilled Prawn in Pesto and Cashew Nuts , Pan Seared Butter Fish with Tri Colour Pepper Sauce, Cheesy Spinach Pie, Au Gratin Lamb Cutlets and Chicken Fricassee with Garden Mushroom. A wondrous spread of Seafood and Meat beckons your pick before it hits the grill and is serve on sizzling plates with the various choices of sauces. Hit the Seafood on Ice Station or the Japanese Bar for delectable choices of Sushi, Sashimi and piping hot Tempura Seafood and Vegetables. 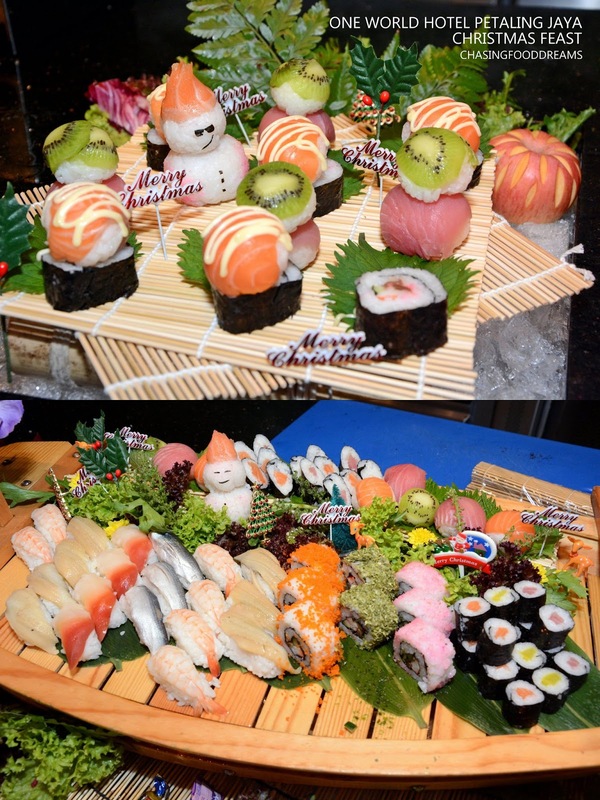 Even the Sushi joins in the festive décor cheer here! 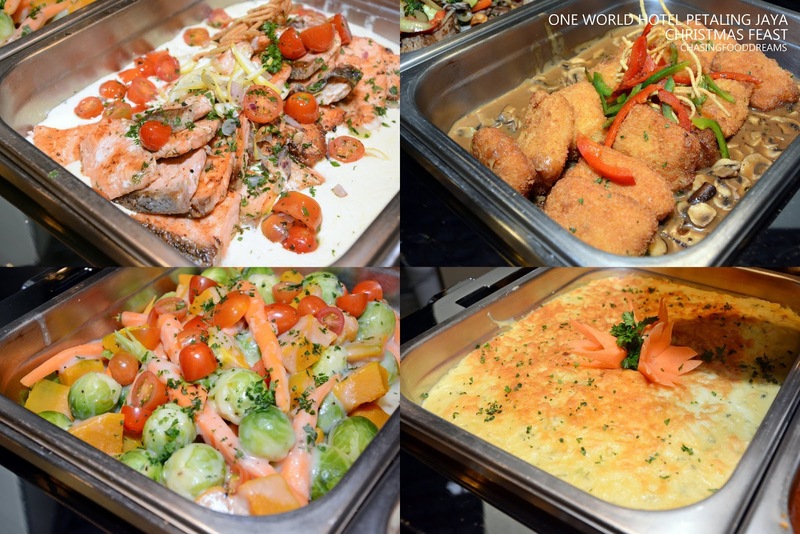 Visit Pasta Station for more classics of Bolognaise, Carbonara, Aglio Olio and more! 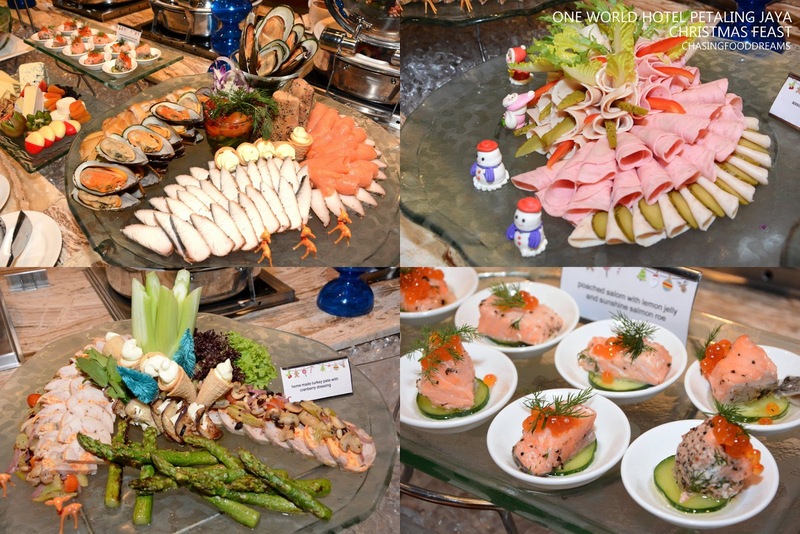 The Appetizer and Salad Bar has scrumptious Smoked Salmon, Mackerel, Seafood Terrine, Cold Cuts, Cheese Board, Crab with Tomato & Avocado Shallot Caulis and a large spread of salads, both international and local. 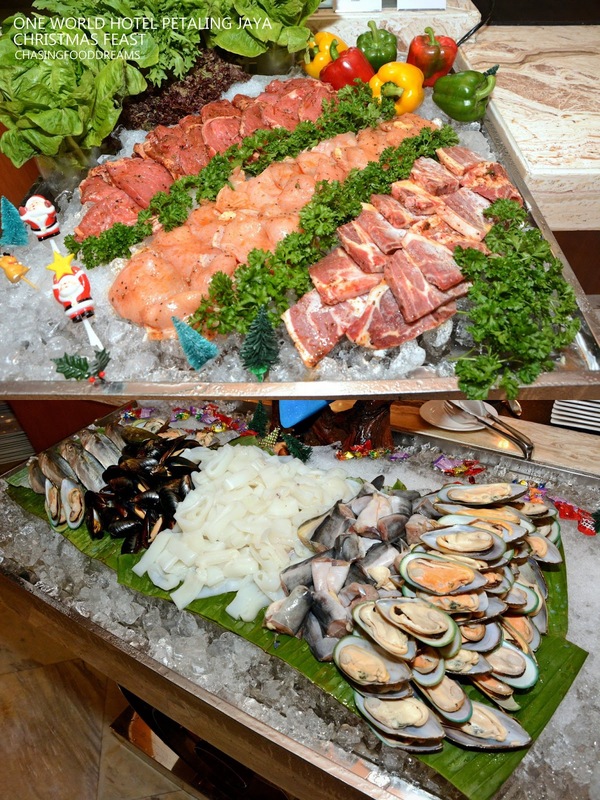 There are also Smoked Seafood Platter with Assorted Berries, Santa’s Favourite Turkey Pate, Chestnut and Squash Cream Soup, Shrimp Cocktail Tacos and Seared Scallop with Lime Jalapeno Aioli and Mozzarella. 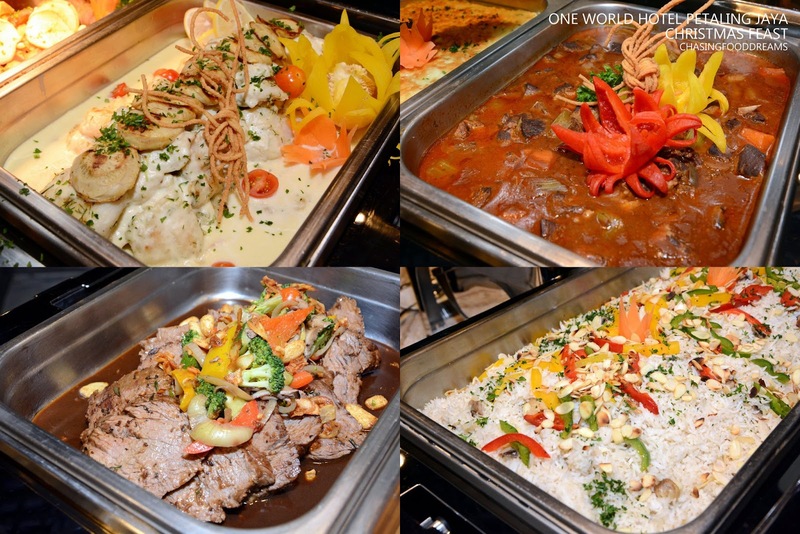 Besides all the festive spread, there are lots of live stations featuring Chinese, Malay and Indian cuisine as well. Cinnamon Coffee House always makes sure that a meal there ends with a big bang of sweetness. 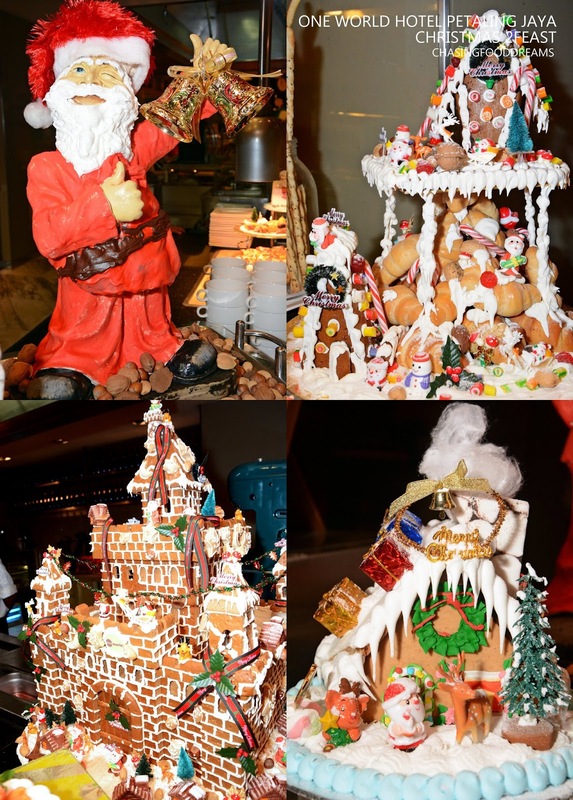 The Dessert Bar is gorgeously set with lots of festive décor from Santa Claus to Gingerbread Castle and Houses. 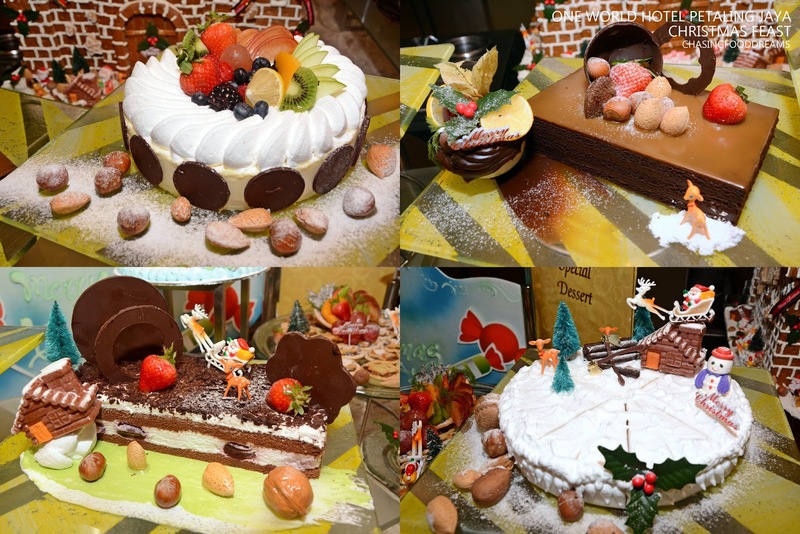 Savor a long list of desserts such as English Fruit Cake, Christmas Cherry Cheese Cake, Baked Christmas Carrot Raisin Cake, Yule Log, Finger Ginger Gigulhorf, Pyramid Torte, Christmas pudding, Mince Pie and the Apple Smith Brownies. There are also Chocolate Fountain and a Bread and Pastry Bar with Ice Cream as well. 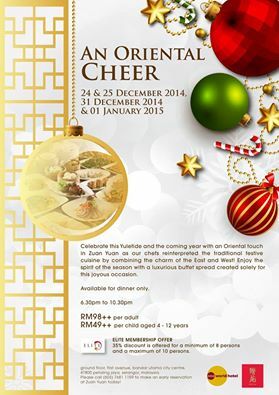 Celebrate this Yuletide with an Oriental touch in Zuan Yuan as the chefs reinterpreted the traditional festive cuisine by combining the charm of the East and West! 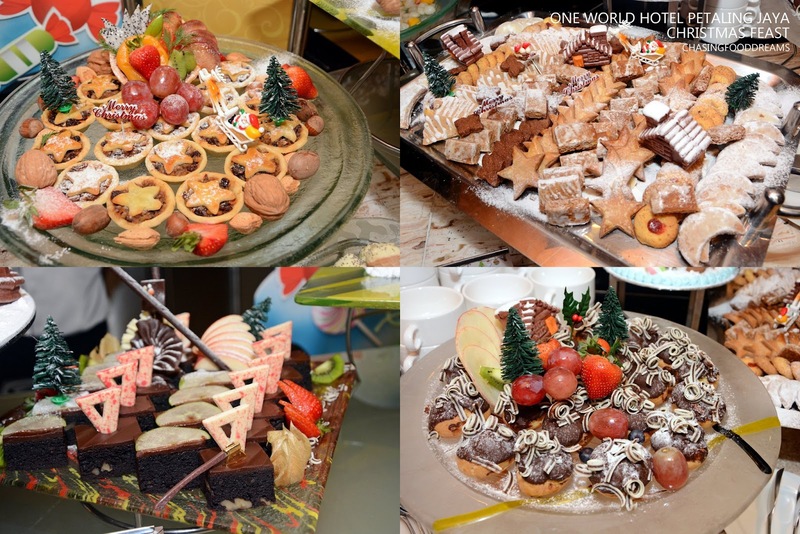 Enjoy the spirit of the season with a luxurious buffet spread created solely for this joyous occasion. Enjoy a gastronomic line-up of mouth – watering Cantonese cuisine, delightful dim sum and fill your plates to the brim with glorious Christmas delicatessen. Let the celebration be a merrier with recommended selections such as the Braised Duck Teo Chew style, Wok Fried Fish Fillet with Spicy Apple Sauce, Stir Fried Ostrich Fillet with Sze Chuan Pepper Oil and Chilli Sauce, Sauteed Sliced Lamb with Kai Lan and Village style Bean Curd in Claypot. Savours the wonders of bite-size morsels with the Steamed classic favourites like the Crystal Prawn Dumpling, Siew Mai with Fish Roe, Loh Mai Kai, BBQ Chicken Bun and add on some of the baked and fried item into the list with Pan or Stir Fried Turnip Cake, Deep Fried Sesame Ball, Crispy Lotus or Red Bean Bun and Taro Dumpling Wu Kok with Black Pepper Sauce. For enquiries or reservations, please call 603 - 7681 1157.